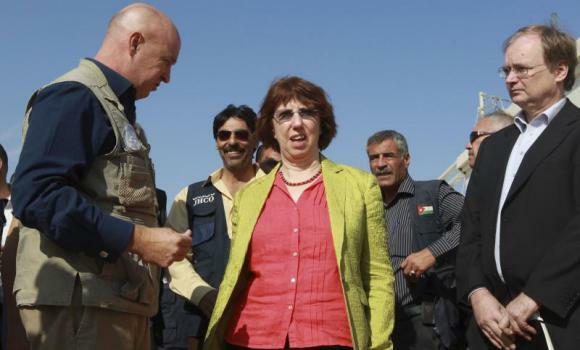 European High Representative Catherine Ashton listens to UNHCR representative to Jordan Andrew Harper (L) during her visit at the Al Zaatri refugee camp in Mafraq, near the Jordanian border with Syria on Monday. Source: Reuters. Last week’s bomb incident in Beirut, which resulted in the death of the head of the Intelligence Branch of the Internal Security Forces (ISF), serves as a reminder of Lebanon’s increasing vulnerability to the escalating conflict in neighbouring Syria. Major General Wissam al-Hassan was an outspoken critic of the Assad regime and played a pivotal role in an investigation that led to the arrest of Michel Samaha, a former Lebanese minister who was charged along with two Syrian army officers of plotting ‘terror attacks’ targeting anti-Syrian politicians in order to incite sectarian strife. Damascus quickly condemned last Friday’s bomb attack and its Ambassador to Lebanon, Ali Abdel-Karim, claimed on Wednesday that “Syria is busy with its own local crisis and had nothing to do with al-Hassan’s assassination”. Nonetheless, al-Hassan’s murder is strikingly similar to another incident that shook Lebanon to its core in 2005, which is the assassination of former Prime Minister Rafik Hariri in a similar car bombing. The anti-Syrian March 14 Coalition remains convinced that both attacks were orchestrated by the Syrian regime, with the help of their allies in Lebanon, mainly Hezbollah, and called for the resignation of Lebanese Prime Minister Najib Mikati and the formation of a new government. The current government is practically dominated by the pro-Syrian March 8 Coalition which includes Hezbollah’s political wing, the Amal party and the Free Patriotic Movement (FPM), a Christian party headed by Michel Aoun. However, both Hezbollah and the FPM lost much of their popularity when they decided to stand by al-Assad despite his bloody crackdown in Syria. Although the Lebanese government publicly pledged to remain impartial when it comes to the Syrian conflict in order to avoid sectarian strife, the reality of the situation is different: Hezbollah and its Iranian patron have been sending armed Shiite men to fight alongside Syrian troops, while Sunni countries such as Saudi Arabia, Qatar and the U.A.E. who are close allies of the March 14 coalition, are also sending funds and weapons to Syrian rebels. Since the assassination of al-Hassan, Lebanon has been engulfed in a wave of violence. Many demonstrations took place in Beirut and its suburbs, and daily sporadic shootings occur, mainly in the North. Tensions are particularly high in the Northern city of Tripoli which is home to the country’s only significant Alawite community loyal to Bashar, and where Sunni residents of Bab al Tabbaneh and Alawite residents of Jabal Mohsen have repeatedly clashed since the beginning of the Syrian uprising. Why should escalating violence in Lebanon matter to European states? Recent security developments in Lebanon must be a matter of great concern to European states. An escalation towards armed conflict in a geo-strategically positioned Lebanon could result into regional collapse and prolonged violence at a time of deep uncertainty in the Middle East. An escalation of violence would also lead to great economic and security risks for Europe and its allies in the region. Over the past decade, Europe has maintained a higher level of credibility in the Middle East than the United States, especially in the Levant where it holds both cultural and economic ties and is seen as a more neutral arbiter. More importantly, European governments and their ambassadors in Lebanon have kept close ties with the majority of Lebanese politicians over the years and have maintained an open dialogue with Hezbollah, which is crucial in order to maintain stability in the country. In a recent conference at the Friedrich Naumann Stiftung on 24 October 2012, Matthew Levitt, Director of the Stein Programme on Counterterrorism and Intelligence at the Washington Institute for Near East Policy, argued that it was time for European States to designate Hezbollah as a terrorist organization in order to facilitate investigations over the group’s alleged criminal activities in Europe. Nonetheless, many European experts have argued that the EU’s approach in Lebanon has proven to be more effective than that of the US or the predominantly Sunni Gulf states who are providing polarizing support to the March 14 coalition and are weary of dialogue with Hezbollah. European States must uphold their support for political consensus and stability in the country and offer strong backing to President Suleiman’s national dialogue policy as well as Prime Minister Mikati’s disassociation policy regarding the Syrian crisis. Now is not the right time for Europe to encourage Lebanon to take a more assertive anti-Assad stance, nor is it a good time for European countries to designate Hezbollah as a terrorist organization considering it is the dominant political force in the country. Besides, Hezbollah is already being held accountable by the Lebanese people themselves regarding its stance on Syria and its chances of winning a majority of votes in the June 2013 parliamentary elections are growing slimmer. Unlike the US, Europe needs to preserve its neutral position for the sake of regional stability, while continuing to press Hezbollah for a meaningful national dialogue concerning its non-state armed wing. Therefore, when the time comes for Hezbollah to transition to a full-fledged unarmed political party, Europe will have much more leverage in the negotiations. EU Member States must also keep providing support to the Lebanese Armed Forces in order to enhance Lebanon’s capacity to avoid an escalation of violence on its territory. Even though the US remains the LAF’s most important backer, EU Member States’ support (particularly France, Italy and the UK) will become even more crucial as the US administration is under pressure from Congress to cut back its support to Lebanon due to Hezbollah’s dominant political role at the moment. The EU should also maintain its focus on strengthening border control, particularly in the North, and continue its security and rule of law programme which provides training for the Internal Security Forces and enhances their criminal investigation skills. Thanks to programmes like these, the ISF is in fact becoming more capable of uncovering terrorist plots and preserving stability. Last month, France became the first European State to directly funnel aid to the Syrian opposition which mostly consisted of humanitarian aid and building material. The EU has also pledged more than €250 million in aid to Syria of which half has already been sent to aid groups in the country. Nonetheless, if European States decide to arm the Syrian opposition, it is crucial that arm shipments do not enter Syria from Northern Lebanon as the region could easily be fully drawn into the conflict. Therefore if arms are to be provided by European states, they must be channeled through non-Lebanese routes in order to shield the country from an uncontainable spill over of violence. The March 14 Coalition was created after the Cedar Revolution of 14 March 2005 which followed the assassination of Sunni Prime Minister Rafik Hariri in a car bomb a month earlier. The coalition is composed of mainly Sunni and Christian parties and is led by Hariri’s son Saad. It stands against Syrian and Iranian intervention in Lebanon and maintains very good ties with Gulf States and the West. Its most prominent parties are the Future Movement, Lebanese Forces and Lebanese Phalanges. Many independents are also members of the March 14 Coalition. The March 8 Coalition is mostly composed of Shia, Alawite and Christian parties and has been the ruling coalition in Lebanon since June 2011. Over the years, the March 8 Coalition has maintained close ties with Syria and Iran. Its most prominent parties are Hezbollah’s political wing, Amal and the Free Patriotic Movement. The US and Israel did not yet took the serious decision to topple Assad in reality. This entry was posted on 26/10/2012 by ISIS Europe in Evita Mouawad, Opinions and tagged EU Crisis Management, Lebanon, Middle East, Migration, Refugees, Syria, Syria crisis.